Reprinted from The Syria Campaign. 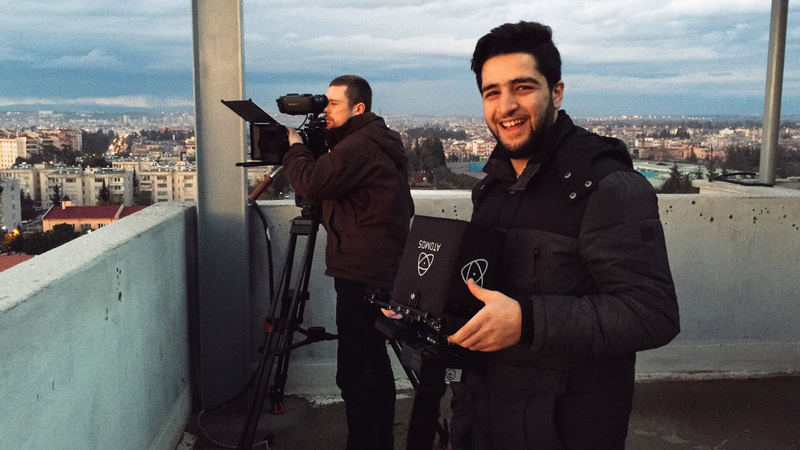 Khaled Khatib is a White Helmet volunteer who worked on Netflix’s ‘White Helmet’ movie. It’s been nominated for an Oscar, results are announced on Sunday 26th. This is his story. I was 16 when the revolution started. In the first few years of the uprising I saw a lot of foreign photojournalists and TV crews come to document what was happening in my city of Aleppo. I watched them dreaming that I could do that: tell the story of my city and my people. When I saw the work of the White Helmets, I knew that was the story of Syria I wanted to tell to tell the world. The White Helmets have a motto taken from the Quran: “to save a life is to save all humanity”. I started to document their work as a volunteer to show the world that everyday Syrians were pulling humanity from the rubble of bombs. When the bombs fall I follow the teams to the scene. I watch as they use diggers, cranes, the drills, their hands — anything that can help rescue those trapped. It is my job to remain calm, to capture the reactions from people recovering from the shock of seeing their homes, families, lives buried under rubble. I try to focus on capturing their stories. The media is so important for the White Helmets and other humanitarian groups working in Syria. We want people to see and understand what is happening: who is doing the killing and who is working for peace. I do this work because I believe if the world understands the suffering of my people they will be moved to stop it; to stand with us on the side of life. In November 2015, the director Orlando von Einsiedel and producer Joanna Natasegara contacted us about making a documentary. They had seen the rescue missions we shot and wanted to tell our story to the world. We watched their other films and understood they are people who know how to tell the stories of heroes. I hoped that we could work together to create a film that would tell the true story of the White Helmets to people around the world. I worked with the team in Adana while they were shooting at the White Helmets training ground. I learnt a lot from the cinematographer Frank Dow about how to shoot, to edit, to tell the story. By the end my notebook was full. It is so important that people see the film. It is important that people understand that Syria has people who want the same things they want: peace, jobs, family, and to live without the fear of bombs. This is what I hope the film does. I plan to travel to LA next week for the Oscars where the film is nominated for an award. If we win this award, it will show people across Syria that people around the world support them. It will give courage to every volunteer who wakes up every morning to run towards bombs. If I cannot enter the US, I will not give up: we know that we have many friends in US, that there are people that share our humanitarian values. I look forward to meeting them all one day. When this war is over I dream of going back to study film — we Syrians have many, many more stories to tell. PS. If you want to send a message of support to Khaled please hit reply to this email and we will pass them all on. PPS. Not watched the Netflix film? Click here.